↑ 4,0 4,1 4,2 German National Library, Berlin State Library, Bavarian State Library et al. Record #118557653 // Gemeinsame Normdatei — 2012—2016. ↑ Erlewine, Stephen Thomas (2006). "Billy Joel Biography. AllMusic. Retrieved on December 7, 2008. ↑ Top Selling Artists. RIAA. Retrieved on June 8, 2012. ↑ Tallmer, Jerry (July 16–22, 2003). 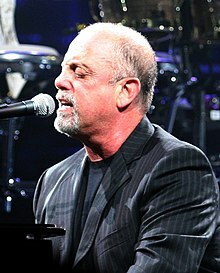 "Billy Joel grapples with the past", The Villager (Manhattan), 73 (11); retrieved December 7, 2008. Archived June 12, 2011, at the Wayback Machine. ↑ "Brinkley, Joel Parents of 'Uptown Girl'". Los Angeles Times, December 30, 1985. p. 2. "The 61⁄2-pound girl, as yet unnamed, was born in a Manhattan hospital at about 11:45 pm Sunday, said the spokeswoman, Geraldine McInerney." "They were married last March aboard a yacht in New York Harbor."